SINGAPORE - SMRT halted train services on the east-bound stretch of the East-West Line (EWL) from 11.15pm until the end of service after a series of train faults on Friday (Nov 10) night. 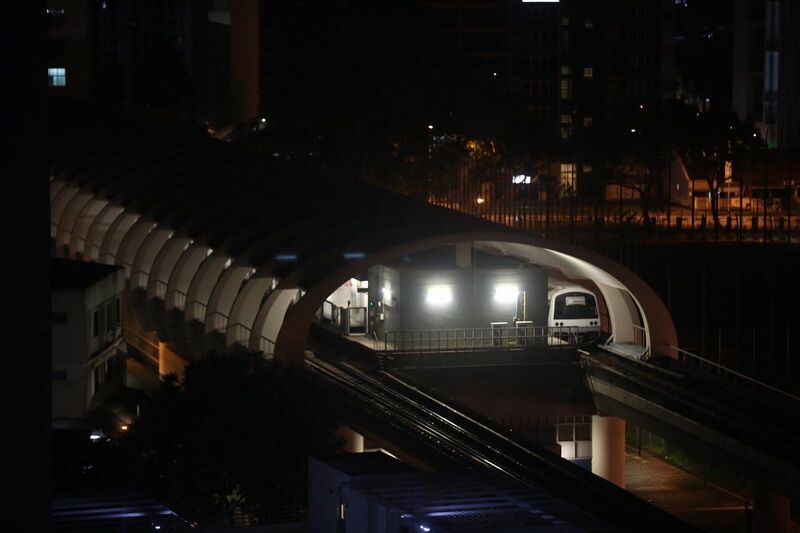 In a statement posted on Facebook past midnight on Saturday, SMRT said a train travelling eastbound on the EWL registered a fault near Outram Park station at 9.40pm. Another train was immediately dispatched to haul the defective train out of service. However, as the coupled trains were travelling towards Changi Depot, they stalled near Paya Lebar station and could not proceed. A second train was deployed to move these two trains. "As the rescue operations require time, east-bound train services were halted between Bugis and Tanah Merah MRT stations from 11.15pm till the end of service," SMRT said. "We are sorry that your journey this evening has been affected." Delays on the line first started when SMRT tweeted at 9.53pm to warn commuters to add 30 minutes' travel time on the west-bound stretch from Bugis to Queenstown. This was followed by delays twice that duration on the east-bound stretch from Tiong Bahru to Pasir Ris over an hour later. Finally, SMRT announced that train service was unavailable on the east-bound stretch from Bugis to Tanah Merah due to a fault at Aljunied station. Free regular bus services were made available throughout the night. Commuters were seen exiting stalled trains at several stations, seeking alternative transport. One commuter, Mr Alvin Ng, told The Straits Times that there were no signs or attempts to stop commuters from entering the crowded Aljunied station even though there was no train service. He was there around 11pm and entered the station. "No one was listening to the announcements at the platform because it was very noisy," said the 30-year-old, who works in sales. He added that the announcements that were made were halting and difficult to listen to. He waited for 20 minutes before leaving as his wife booked a Grab car for him. His journey from Aljunied to Joo Chiat usually cost about $8 to $10 but cost him about $30 this time. "They did not give any reason for what is happening," he said. "They just said no train service. I know this, but why?" Mr Hamzah Jamaludeen, 16, a part-time hotel banquet assistant, said he was “disappointed” by the disruption. Mr Hamzah said he boarded the train at City Hall station and was heading towards Eunos but was told to get down at Bugis. He said: “I need to get to Eunos as soon as possible to catch the feeder bus home to Marine Parade. I’m not sure if I’ll make it in time now,” he added. When The Straits Times arrived at Bugis station around midnight, commuters affected by the disruptions were boarding buses at the bus stop outside the station. Signs were put up that read: "MRT services affected. Continue your journey for free on any regular bus service that calls at this bus stop." Commuters at Bugis station were handed information sheets with details of alternative transport arrangements. Ms Ng K., 41, another commuter who had to alight at Bugis station to change to a bus, lamented the lack of information on which buses she could take to go to Pasir Ris. Ms Ng said she boarded the train at Pioneer station at 10.30pm and reached Bugis only past midnight. “The train stopped for long periods at every station after Lakeside MRT,” said the Master's student. “I’m pretty upset. We are all very tired,” she added. On Friday morning, the North-South Line was also hit by a train fault that caused delays of up to 20 minutes from Yishun to Ang Mo Kio stations.